Original Editors - Kim McMillin from Bellarmine University's Pathophysiology of Complex Patient Problems project. Lymphatic filariasis is a disease associated with parasitic infection of one of three different nematodes: Wuchereria bancrofti, Brugia malayi, or Brugia timori. The microscopic worms enter the human body via mosquito transmission- in both children and adults- and can live up to 5-7 years in the lymphatic system. Although most people who are infected are asymptomatic, a small percentage of people will develop extreme lymphedema and multiple secondary infections as a result of years of exposure to the parasites. It is estimated that more than 120 million people in 80 countries worldwide are currently infected with one of the three nematodes. Greater than 90% of those 120 million people are infected with the Wuchereria bancrofti filaria, and the majority of the remaining ~10% are infected with the Brugia malayi filaria. Reports also suggest that more than 40 million people are significantly dibilatated and disfigured by the disease. Lymphatic filariasis is endemic is the tropic and sub-tropics of Southeast Asia, Africa, the India Subcontinent, the Pacific islands, and parts of the Caribbean and Latin America. The majority of people who become infected with filariasis do not show any overt clinical signs or symptoms, although they will experience irregularities in their lymphatic drainage. It is estimated that only one-third of those infected by any of the filarial nematodes show obvious clinical features of the condition. Experts have attributed the severity of symptoms as being positively correlated with extended time of exposure and accumulation of worms. Acute adenolymphangitis: Characteristics include painful lymphadenopathy and retrograde lymphangitis that most often affect the inguinal nodes, genitalia, and lower extremities leading to extreme edema, elephantiasis, and sometimes skin breakdown and secondary infections. Flare-ups can last 4-7 days and occur up to 4 times per year depending on the severity of the lymphedema. Filarial fever: Often an acute fever that occurs independently of any other signs of lymphadenopathy. Filarial fever is sometimes misdiagnosed as a manifestation of malaria and other tropical diseases because of the lack of associated symptoms. Tropical pulmonary eosinophilia: Most commonly seen in young males and is caused by microfilariae being trapped in the lungs. The immune system exhibits a respiratory "hyperresponsiveness" to the problem, causing excessive nocturnal wheezing. Lymphedema: Commonly involves vessels in the inguinal and axillary lymph nodes, affecting all four extremities. Early stage lymphedema is usually characterized by pitting edema, but more chronic stages exhibit non-pitting edema with hardening of the surrounding tissues, eventually leading to hyperpigmentation and hyperkeratosis. Chronic manifestations can also involve the breasts and male genitalia. Hydroceles (swelling of the scrotum) can be greater than 30cm in diameter, but are usually painless unless bacterial infection is present. Renal Pathology: When renal system lymphatic are obstructed, lymph fluid can be passed into the renal pelvis. 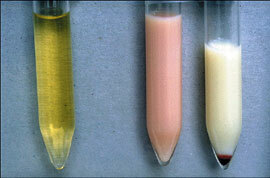 Chyluria, or lymph fluid in the urine, causes a milky appearance in the excreted urine. Hematuria and proteinuria may also be present and can eventually cause nutritional deficiencies and anemia. Secondary infections: Bacterial and fungal infections become problematic in lymphatic filariasis due to edema-causing skin folds and skin tears. Side effects include fever, headache, anorexia, nausea, and arthralgias. There is no one best treatment for filariasis. Efficacy is greatest when a combination of drugs are used; most commonly, DEC in addition to Ivermectin or Albendazole. Unfortunately, certain endemic regions are also susceptible to infection by other nematodes: onchocerciasis (also known as river blindness) and loiasis (also known as African eye worm). Use of either DEC or Ivermectin in those who are co-infected can cause serious adverse effects, including but not limited to encephalopathy. 1. Lymphatic: Adult filariae can live in the lymphatic system for up to 7 years while continuing to reproduce, leading to obstruction of drainage and destruction of vessels. 2. Renal: Intestinal lymph fluid can be deposited into the renal pelvis and eventually make its way to the urine to be excreted by the body (chyluria). This can lead to hypoproteinemia, hematuria, and anemia as large amounts of fat and protein are lost through the urine and lymph fluid. 3. Dermatological: Pitting edema, hyperpigmentation, and hyperkeratosis are present as a result of the associated lymphedema. 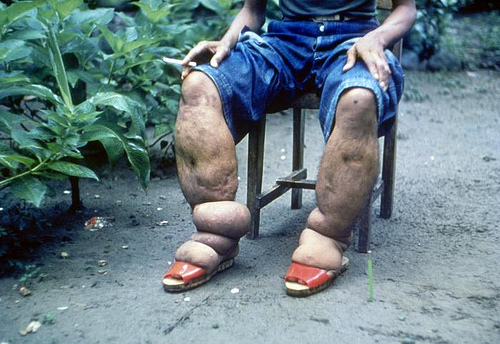 In severe cases, affected individuals develop elephantiasis. 4. Reproductive: In females, involvement of the breast tissue and ovaries (along with upper or lower limb edema) is not uncommon. In males, the genitalia can be severely affected. Unilateral or bilateral hydroceles in the scrotum (especially in the spermatic cord) can lead to disfigurement and loss of sexual function. 5. Immune: Other bacterial or fungal infections often develop as a secondary result of lymphatic filariasis, primarily due to excessive skin folds and skin tears. Chronic conditions of LF is generally not a concern for those people who wish to visit endemic regions of the world because they do not stay long enough to accumulate a harmful amount of microfilariae, although the following mild, allergic-like symptoms have been reported: lymphangitis/lymphadenitis, urticaria (hives), rash, and peripheral eosinophilia. Recommendations for travelers are as follows: wear long sleeves and long pants, sleep under a mosquito net or in air conditioning, use bug repellent, and stay indoors or away from mosquito breeding grounds between dusk and dawn (they're preferred biting time). 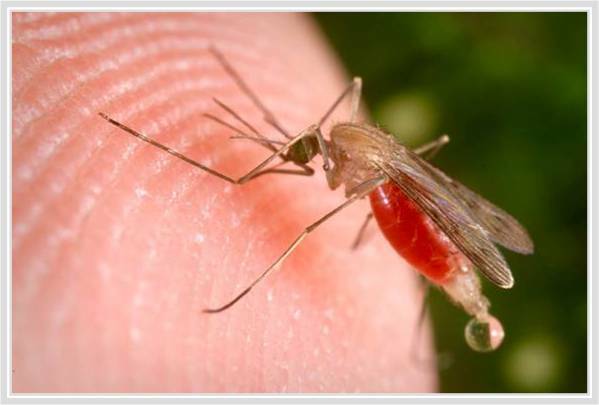 Clinical manifestations of filariasis such as lymphedema and elephantiasis are caused by prolonged exposure to filariae and the mosquitos that transmit them in endemic regions. 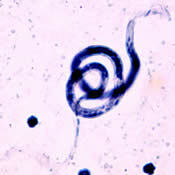 These affected individuals are usually not actively infected; rather, they are suffering from the effects of years of exposure to one of the three nematodes. Medical management is not appropriate for these individuals. Physical therapy management of the disease primarily consists of treatment from a lymphedema therapist, along with education of proper skin care and hygiene. Appropriate exercise prescription and wound care management are also indicated. There is no physical therapy intervention indicated for hydrocele; those infected usually do not respond well to DEC, and surgery is required in some cases. Barreto SG, Rodrigues J, & Pinto RGW. Filarial granuloma of the testicular tunic mimicking a testicular neoplasm: a case report. Journal of Medical Case Reports. 2008; 2(321). Cengiz N, Savaş L, Uslu Y, Anarat A. Filariasis in a child from southern Turkey: a case report. Turk J Pediatr. 2006 Apr-Jun; 48(2):152-4. Kapoor AK, Puri SK, Arora A, Upreti L, Puri AS. Case report: Filariasis presenting as an intra-abdominal cyst. Indian J Radiol Imaging 2011; 21:18-20. Casley-Smith JR and Casley-Smith JR. Modern treatment of lymphoedema II:The Benzopyrones. Australasian J of Derm. 1992; 33(2): 69-74. ↑ 1.0 1.1 1.2 1.3 1.4 1.5 Center for Disease Control and Prevention. Disease search: filariasis. http://www.cdc.gov/parasites/lymphaticfilariasis/. (Accessed February 27, 2011). ↑ Lymphatic filariasis: the disease and its control. Fifth report of the WHO Expert Committee on Filariasis. World Health Organ Tech Rep Ser 1992; 821:1. ↑ Ngwira BM, Jabu CH, Kanyongoloka H, et al. Lymphatic filariasis in the Karonga district of northern Malawi: a prevalence survey. Ann Trop Med Parasitol 2002; 96: 137. ↑ Pani SP, Srividya A. Clinical manifestations of bancroftian filariasis with special reference to lymphoedema grading. Indian J Med Res 1995; 102:114. ↑ 5.0 5.1 Sethi S, Misra K, Singh UR, et al. Lymphatic filariasis of the ovary and mesosalpinx. J Obstet Gynaecol Res 2001; 27:285. ↑ 6.0 6.1 Franco-Paredes C, Hidron A, Steinberg J. A woman from British Guyana with recurrent back pain and fever. Chyluria associated with infection due to Wuchereria bancrofti. Clin Infect Dis 2006; 42:1297, 1340. ↑ 7.0 7.1 Dreyer G, Ottesen EA, Galdino E, et al. Renal abnormalities in microfilaremic patients with Bancroftian filariasis. Am J Trop Med Hyg. 1992; 46:745. ↑ Tisch DJ, Michael E, Kazura JW. Mass chemotherapy options to control lymphatic filariasis: a systematic review. Lancet Infect Dis. 2005; 5:514. ↑ Cao WC, Van der Ploeg CP, Plaiser AP, et al. Ivermectin for the chemotherapy of bancroftian filariasis: a meta-analysis of the effect of single treatment. Trop Med Int Health. 1997; 2:393. ↑ Taylor MJ, Makunde WH, McGarry HF, et al. Macrofilaricidal activity after doxycycline treatment of Wuchereria bancrofti: a double-blind, randomized placebo-controlled trial. Lancet 2005; 365:2116. ↑ 11.0 11.1 World Health Organization. Disease search: Lymphatic filariasis. http://www.who.int/mediacentre/factsheets/fs102/en/. (Accessed March 10, 2011). ↑ Ottesen EA, Weller PF. Eosinophilia following treatment of patients with schistosomiasis mansoni and Bancroft's filariasis. J Infect Dis 1979; 139:343. ↑ Lal RB, Ottesen EA. Enhanced diagnostic specificity in human filariasis by IgG4 antibody assessment. J Infect Dis 1988; 158:1034. ↑ Weil GJ, Ramzy RM. Diagnostic tools for filariasis elimination programs. Trends Parasitol 2007; 23:78. ↑ Mand S, Debrah A, Batsa L, et al. Reliable and frequent detection of adult Wuchereria bancrofti in Ghanaian women by ultrasonography. Trop Med Int Health 2004; 9:1111. ↑ Freedman DO, de Almeida Filho PJ, Besh S, et al. Lymphoscintigraphic analysis of lymphatic abnormalities in symptomatic and asymptomatic human filariasis. J Infect Dis 1994; 170:927. ↑ Global Alliance to Eliminate Lymphatic Filariasis. http://www.filariasis.org/all_about_lf/management.html. (Accessed March 14, 2011). ↑ American Academy of Family Physicians. http://www.aafp.org/afp/981015ap/ferrer.html. (Accessed March 16, 2011).